Teaser Storyline for "The Devil Made Me Woman"
Antonio (George Mistral), a rebel leader, and his men have ambushed a French patrol, part of the force which has occupied his country. Antonio, slightly wounded takes refuge in Carmen's tavern room. 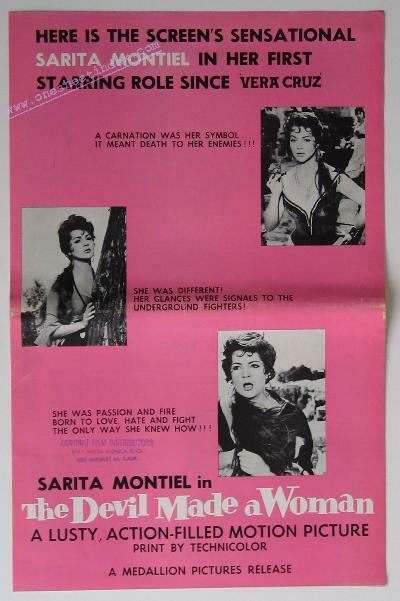 Later that night, Carmen (Sarita Montiel), who sings in the tavern, meets Jose (Maurice Ronet) a French sergeant and is enchanted by his freshness. A jealous woman, recently rejected by Antonio in favor of Carmen, knows where he is hiding and reports it to the French. Antonio, after a battle, is captured by Jose despite Carmen's attempt to foil the arrest. Jose, also now infatuated by Carmen, conceals her part in the affair. French colonel He and Carmen have no choice but to flee and join up with Antonio. The rebel leader, insanely jealous, provokes Jose into a knife fight and severely wounds him. Just then French patrols reach their hideout area. As the guerillas skirmish with the French, Jose and Carmen manage to escape. They make their way back to Carmen's room. They are seen doing so by the jealous informer. When she knows that Jose is alone, she goes to him and misleads him into believing that Carmen will betray him to the French for a new lover. She, then, goes to the French headquarters and discloses Jose's hideout. When Jose sees the soldiers surround the building, he confronts Carmen as she is singing on the tavern floor. Before she can defend herself, the French burst into the tavern. She throws herself in the path of a bullet meant for Jose and falls mortally wounded. Jose is also shot down just as Antonio and his men launch their big offensive.